Emergency services are planning for any possible disruption to the Humber ports that might be caused by a no-deal Brexit. Humber Local Resilience Forum (LRF) said it was drawing up contingency plans to cope with Britain's exit from the EU on 29 March. The forum said possible problems could include an increase in the time taken to process traffic at ports. 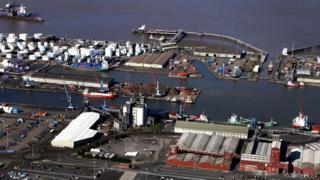 Hull, Immingham, Grimsby and Goole are among the busiest ports in the UK. The LRF is made up of the emergency services, NHS trusts, local councils and port operator Associated British Ports. The LRF said it had been considering "how we would reduce delays and we have been preparing traffic management plans to minimise disruption to local residents, businesses and communities". It said other considerations included disruption on the region's roads, the "welfare of hauliers" and "supply chain issues arising from delays at ports". The LRF would not reveal specific plans drawn up to deal with any problems caused by Brexit. The four ports on the Humber estuary handle more than 65 million tonnes of cargo each year, with Immingham the UK's largest port by volume. In November, a group of MPs said there was a "real prospect" of "major disruption" at UK ports in the case of a no-deal Brexit. The Department for Transport (DfT) said the MPs' comments were not "accurate".